Celebrated on the first Sunday in May, Coffs Harbour hosts the annual Japanese Festival of Children's Day in the Japanese Gardens within the North Coast Regional Botanic Garden. 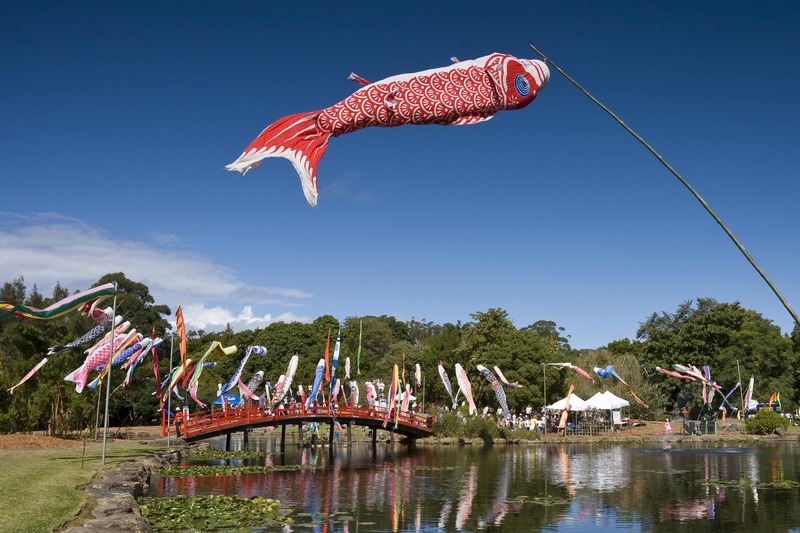 With more than 100 Koinobori (Koi Kites) flying in the sunshine over the arched bridge and teahouse, there is food, entertainment and cultural celebrations throughout the day. The Koi Society in partnership with the Bonsai Society, Friends of the North Coast Botanic Gardens and Coffs Harbour City Council will be hosting this year's event starting at 10am with the official opening at 11am by Mayor Councillor Denise Knight RN and a welcome by the Japanese Consul to Australia. There will be Kensei Karate demonstrations, Taiko Drumming, Watermelon smashing, Koi fish judging, music, face-painting, calligraphy available throughout the day. Entry will be with a gold-coin donation.